I adore ginger and what better way to eat it than in cake. There is nothing quite as joyous as a late afternoon slice of cake with a cup of coffee or tea. It is a wonderful time to sit and reflect and lose yourself in your thoughts for a little while. This recipe by Tom Dalby is a favourite of mine as it’s easy to prepare and even easier to eat. It suits any occasion, afternoon tea, celebration cake or even as dessert. 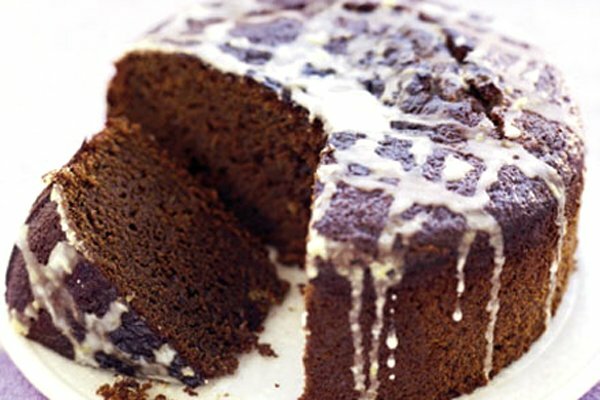 i have been known to serve the ginger cake warm with custard instead of the lemon icing….luscious! Preheat the oven to fan 160C/conventional 180C/gas 4. Butter and line an 18cm round, 7cm deep cake tin with greaseproof or parchment paper. Put the flour, bicarbonate of soda and all the spices into a large mixing bowl. Add the butter and rub it into the flour with your fingertips until the mixture resembles fine breadcrumbs. Put the sugar, treacle, syrup and milk in a medium saucepan and heat, gently stirring until the sugar has dissolved. Turn up the heat and bring the mixture to just below boiling point. To make the icing, mix together icing sugar and lemon zest, then gradually add lemon juice until you have a smooth, slightly runny icing, adding more juice, if needed. Drizzle icing in a zig-zag pattern over surface of cake, turn cake around and drizzle again to create the cross-hatched finish (see below). Cake keeps for up to 2 weeks stored in an airtight container. Brussels sprout gratin with bacon, cream and almonds. Fill in the form below to sign up for our monthly Newsletter. You'll receive all the latest news from from Ffiona's, along with details of up and coming events, special offers and recipes for some of our favourite dishes. Copyright - Ffiona's Restuarant 2016. This dish is suitable or can be adapted to be suitable for those who are on a Gluten Free Diet. As part of our Inclusive NOT Exclusive initiative we have introduced many new dishes and tweaked some of our long standing favourite dishes so that they can be enjoyed by those with specific dieatary requirements. This dish is suitable or can be adapted to be suitable for those who are on a Dairy Free or Lactose Free Diet. This dish is suitable or can be adapted to be suitable for those who are on The Paleo Diet. Sign up to receive our monthly newsletter. Every month we send out a Newsletter letting you know about the latest news and goings on at Ffionas. You’ll find tasty recipes of some of our favourite dishes, details about fun and interesting things to do in and around Kensington, along with all the news from Ffiona's. Just fill in the short form below to register.